Metadata contains a reference that cannot be resolved: 'http://localhost/DataServices/DataService.svc'. The IIS configuration is incorrect or has become corrupted in some ways. When re-installed the IIS, be sure to restart the computer. The OS will not ask you to restart on re-install, but in my case the IIS was completely stuck. 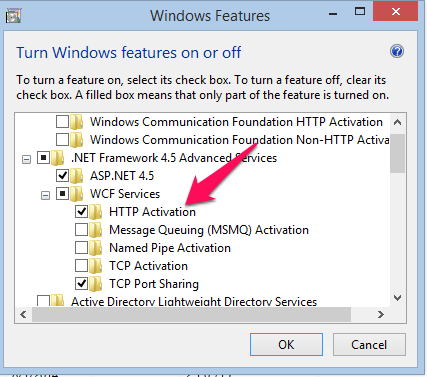 Next and most important is this, Be sure that in the .NET Framework 4.5 Advanced Services, and under WCF Services, the HTTP Activation is enabled. First test with the IIS Express built into your Visual Studio. If that does not work, then there can be a coding issue. Do not bother with editing the web.config file yet (to create behaviors and endpoints). The default ought to work.